Welcome this upholstered chair into your living room. It features a traditional style with a fully tailored skirt, padded rolled arms and semi-attached inside back. 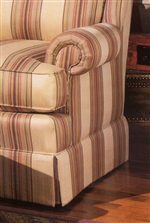 The rolled arms add a finishing touch to the chair and also ensures extra comfort and softness. Pair with the upholstered ottoman for a perfect match. 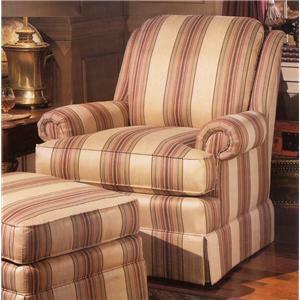 The 971 Upholstered Swivel Glider Chair by Smith Brothers at Wayside Furniture in the Akron, Cleveland, Canton, Medina, Youngstown, Ohio area. Product availability may vary. Contact us for the most current availability on this product. Bring home the traditional style of the 971 Upholstered Collection. This collection features a chair and ottoman that will fit nicely in any home. Features included are a fully tailored skirt, padded rolled arms to ensure extra comfort and softness and a semi-attached inside back. This collection is available by special order only. Choose the upholstery you want with a choice of over 800 options! Create your one of a kind look for your living room. The 971 collection is a great option if you are looking for Traditional furniture in the Akron, Cleveland, Canton, Medina, Youngstown, Ohio area. Padded Rolled Arms Ensures that Extra Comfort and Softness. Browse other items in the 971 collection from Wayside Furniture in the Akron, Cleveland, Canton, Medina, Youngstown, Ohio area.